Headline sales rose by 0.6%, better than expected, but the Control Group was not that great. The US Dollar was on the back foot ahead of the publication and the picture has not changed. US Retail Sales rose by 0.6% MoM, better than expected. Core Retail Sales came out at 0.2% MoM, exactly as expected. The most important part, the Retail Sales Control Group, came out at 0.4%, also as expected. However, this comes on top of a downward revision for the Control Group for February: a flat read instead of an increase of 0.1% originally reported. In addition, the New York Fed Manufacturing Index came out at 15.8 points in April, worse than 18.80 that was estimated and a significant drop from 22.50 in March. All in all, the slight beat on the headline Retail Sales report is not enough to stop the slide of the US Dollar. 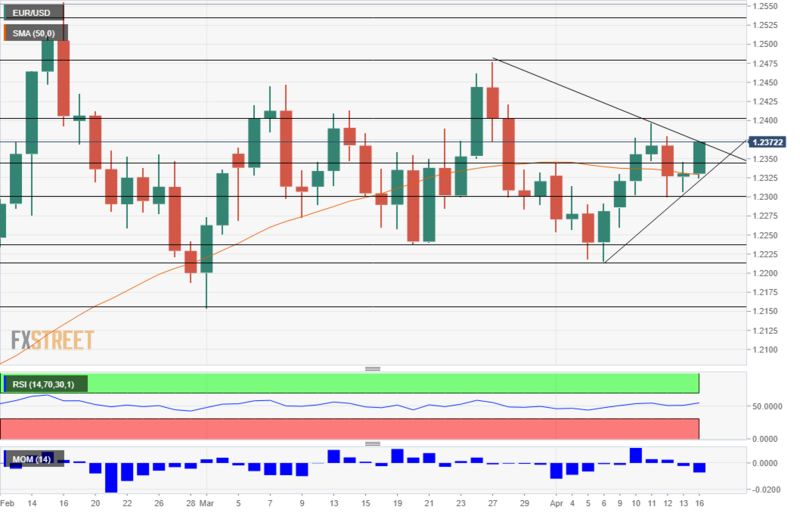 The EUR/USD is ticking up to $1.2374 after the publication, a new daily high. The EUR/USD traded around $1.2360 ahead of the publication, ticking down from the highs of $1.2373 it had reached earlier. All in all, it remains up on the day. The range in the previous week was $1.2300 to $1.2395. It holds onto the range in the aftermath. After mediocre Retail Sales figures for February, expectations for the March report were higher. Headline Retail Sales were projected to rise by 0.4% MoM after a drop of 0.1% beforehand. The Retail Control Group, seen as the core of the core, was forecast to increase by 0.4% after a modest 0.1% last month. The regular Core Retail Sales figure carried expectations for repeating the 0.2% increase once again. Markets ignored the airstrikes in Syria over the weekend. The US, the UK, and France attacked three chemical weapons installations in the war-torn country early on Saturday. By the time markets had opened, a narrative of a one-off move had already emerged. Without further strikes from the West nor a retaliation from Syria, Iran, or Russia, the focus moved on to economic data and monetary policy.